30cm x 11cm x 33.5cm/11.8"*4.3"*13.2"(L*W*H)( 39cm/15.4" upper length folded ). The felt fabric bag keeps its shaped and protecting your items. It can be foldabled when not in use, save space. 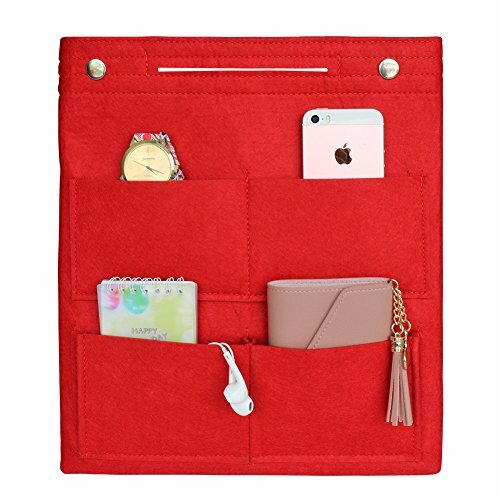 PREMIUM QUALITY MATERIAL - Our handbag organizer for women is made out of superior highly durable felt. MULTIPLE POCKETS --- Insert organizer,8 pockets outside and 9 pockets inside. EASY TO MAINTAIN - Our tote organizing bag is very easy to clean and storage. The smart, foldable design allows for easy storage without occupying much space. DIMENSIONS: 30cm x 11cm x 33.5cm/11.8"*4.3"*13.2"(L*W*H)( 39cm/15.4" upper length folded). MADE FOR TRAVELING - Store your electronics, cosmetic supplies, keys, credit cards, wallets, purses, phones and anything you need to carry with you. If you have any questions about this product by VANCORE, contact us by completing and submitting the form below. If you are looking for a specif part number, please include it with your message.